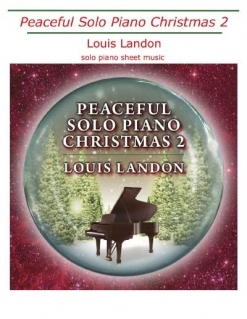 Peaceful Solo Piano Christmas 2 is the companion sheet music book for Louis Landon’s 2017 album release by the same name. Fourteen of the fifteen tracks from the album are included. (Sheet music permission can be much more difficult to obtain than recording rights. “The Christmas Song [Chestnuts Roasting On an Open Fire]” is not included because it is not in the public domain.) The songbook contains twelve traditional Christmas carols and two originals. Actually, there are quite a few more traditional songs, as Landon’s “My Joyous Christmas Soul” has snippets of six carols within the piece. 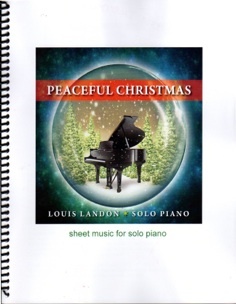 Based on “My Joyous Soul” from his 2012 album, Peaceful Solo Piano from the Heart, this piece is particularly fun to play! With improvisation and jazz being such a big part of Landon’s musical style, his sheet music can be difficult to play, but the arrangements in this collection are shorter and most are very straight-forward. Pianists at an upper-intermediate to early-advanced playing level (and above, of course!) should have little trouble mastering most of these pieces. The only difficulty I encountered was that some of the repeats within the music are confusing. The first, second and sometimes third endings are long and require the pianist to make some big jumps forward and back, with the subsequent endings difficult to spot quickly. The timing in “We Three Kings” is tricky, but once you get the feel of the melody, it falls into place. There are lots of octave chords throughout the book, but only a few reaches of more than an octave. Sample pages are available from the store on Landon’s website. The book itself has a full-color reproduction of the album artwork on the cover and is spiral-bound. The music is well-spaced, clear, and easy to read. 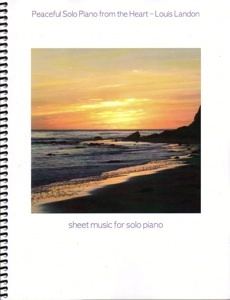 The music is printed on a medium-weight paper stock that makes page turns easy and should hold up well to years of playing enjoyment. Metronome settings are included, as are pedaling suggestions. 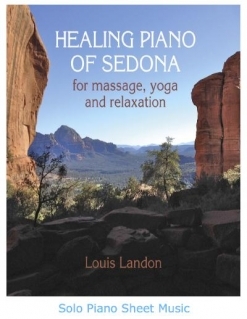 In addition to the physical book, the sheet music is available for download either singly or as a full book on Louis Landon’s website. The release date the for the album and the book is November 12, 2017, but both are available for pre-order now. Recommended!